NS-5GT mitigated the effect of DDoS traffic to some extent especially when the attack of lower intensity. protect a critical information infrastructure. vice attacks do not seem to have gone away completely. tive results. Section 4 concludes the paper. such as TCP-SYN flood or UDP-flood attacks. are never answered with the final ACK packets. computing resource at the victim computer. Figure 1. TCP SYN flood attack. is terminated or timed out. UDP is another common Layer-4 traffic on internet. Figure 2. SYN Proxy protection . passes the UDP datagrams only if a policy permits them. be targeted to a DNS server. tions per second against different loads of attack traffic. XeonTM 3GHz Processor a n d 4 GB R AM w ere used. Figure 3. UDP flood protection method used by NS-5GT . Figure 4. 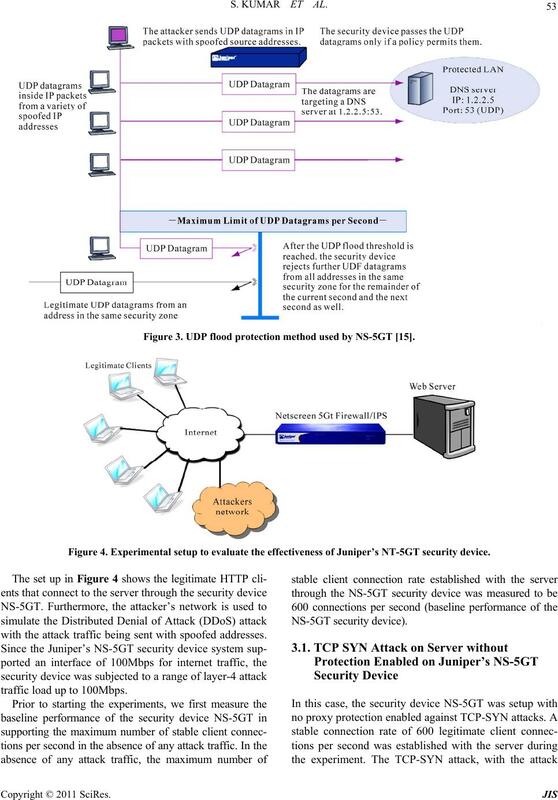 Experimental setup to evaluate the effectiveness of Juniper’s NT-5GT security device. with the attack traffic being sent with spoofed addresses. traffic load up to 100Mbps. 54 S. KUMAR ET AL. gateway) at different attack loads is shown in Figure 5. Figure 5. 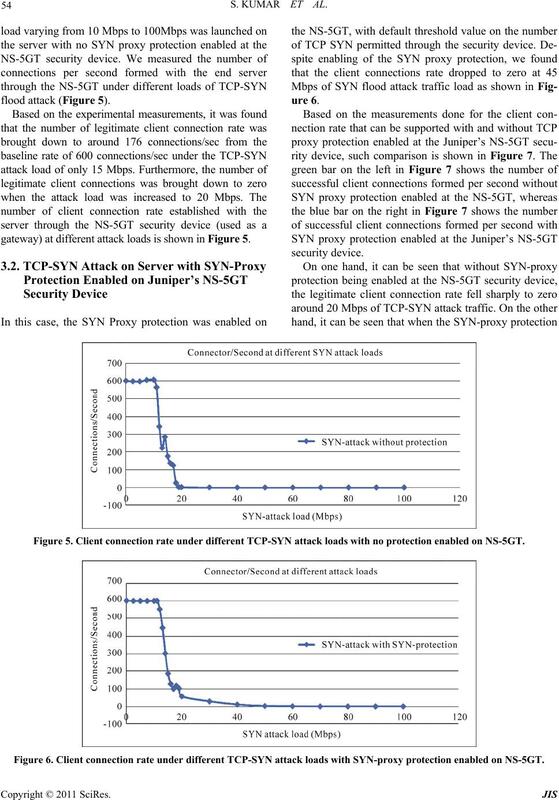 Client connection rate under different TCP-SYN attack loads with no protection enabled on NS-5GT. Figure 6. Client connection rate under different TCP-SYN attack loads with SYN-proxy protection enabled on NS- 5GT. protection features against such attacks. wards the server through the security device NS-5GT. rate was measured and plotted in Figure 8.
reachable packet as reply for the received packets. under UDP att ack loa d o f 40 M bps or higher. 56 S. KUMAR ET AL. ond was measured against different loads of attack. decrease of arou nd 38% in the baseline performance. or higher, no client connections could be established i.e. 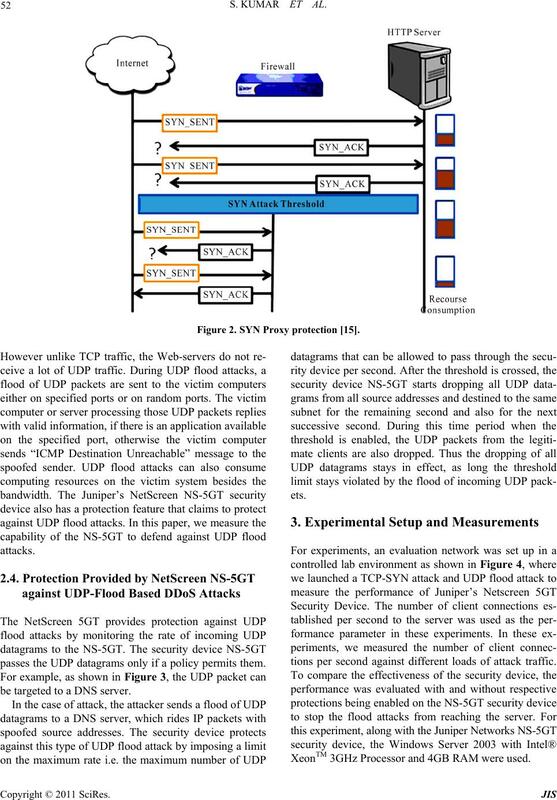 ing against UDP flood attacks of higher intensity (i.e. Figure 8. Client connections established under different UDP flood attack loads with no protection enabled on NS-5GT. Figure 9. Client connections established under different UDP flood attack loads with UDP-protection enabled on NS-5GT. Figure 10. 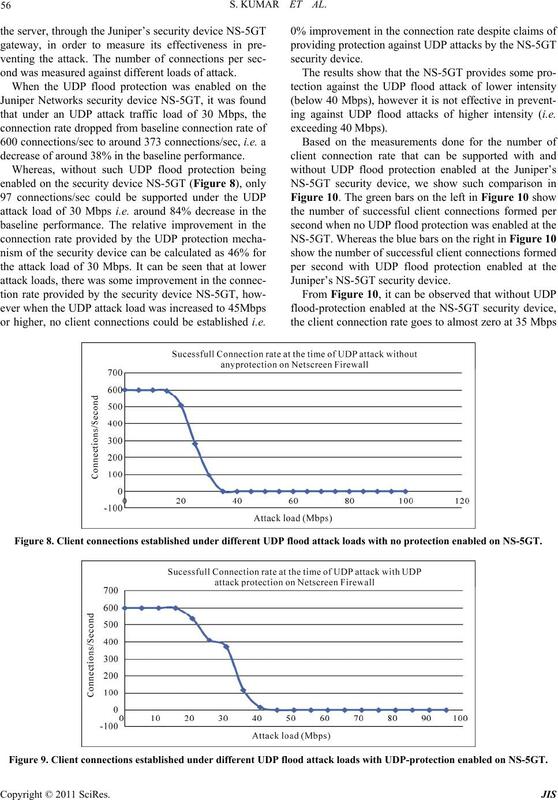 Comparison of Connection rate with and without UDP-flood protection enabled on the NS-5GT security device. 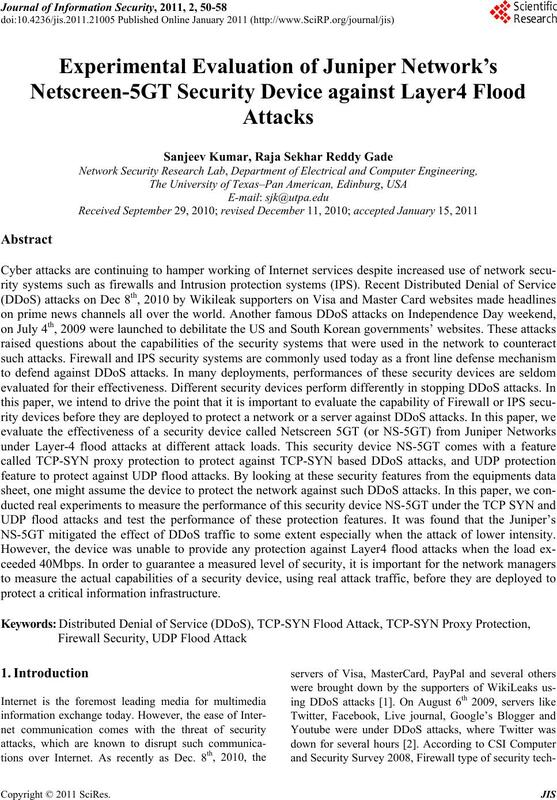 attacks considered in this paper. of limited capability in preventing layer4 DDoS attacks. by US National Science Foundation under Grant No. sory CA-2001-20,” 15 October 2010. http://www.cert. 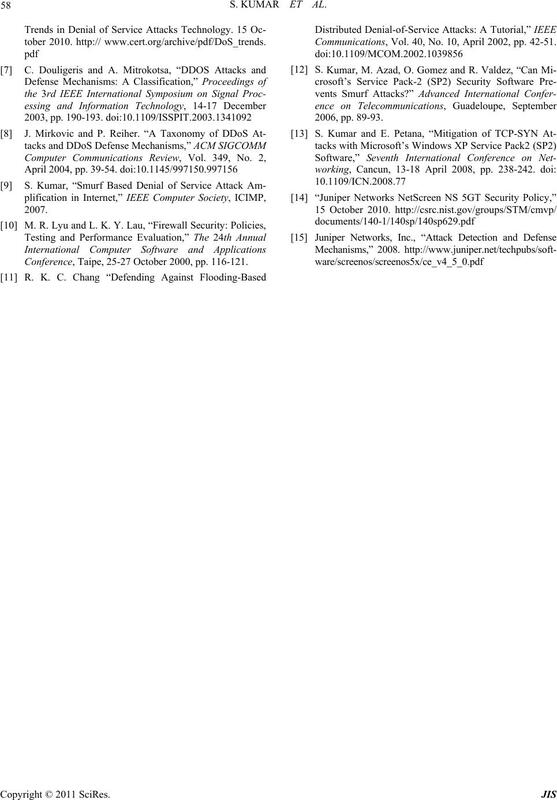 58 S. KUMAR ET AL. Conference, Taipe, 25-27 October 2000, pp. 116-121. Communications, Vol. 40, No. 10, April 2002, pp. 42-51.